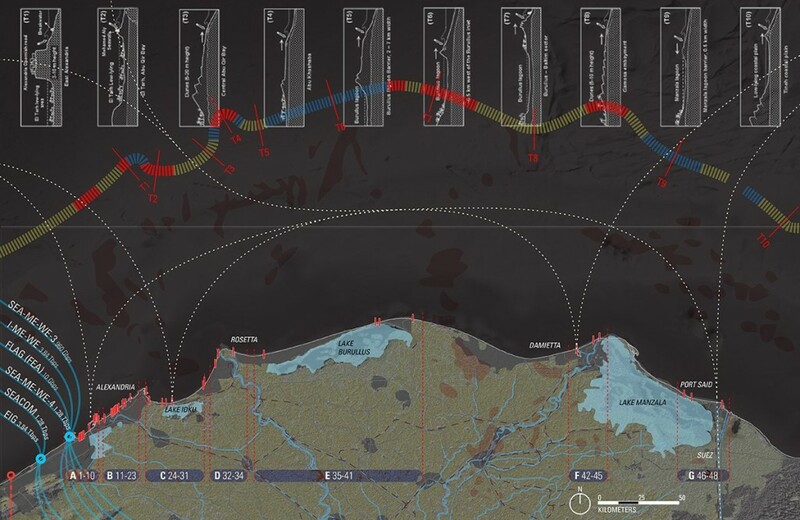 Tamer Elshayal and Vineet Diwadkar with support from the Penny White Prize and Paul M. Heffernan Fellowship at the Harvard University Graduate School of Design. Lying at the farthermost downstream point of the Nile River, the alluvial Delta is the final destination for the river’s water and sediments transported over 6,650 km before discharge into the Mediterranean. As such, the Nile Delta Estuary is a terminal site indicative of hydrological and political conditions prevalent in the whole Nile Basin shared by 10 countries. Upstream land use decisions and practices – the contentious Ethiopian Millennium Dam, land reclamation projects, or the water-intensive agri-/aqua- culture – determine the hydro-ecological conditions of the littoral zone, and hence the livelihoods of local communities. Production activities within the Nile Delta region include 40% of Egypt’s industrial activity, 50% of its protein production (through fisheries) and the majority of its agricultural production. 1. To understand how coastal engineering in the Nile Delta mediates hydrological processes of sedimentation and erosion to construct a synthetic coastline, and to examine the spatial implications/opportunities of these coastal protection works as infrastructural landscapes. 2. 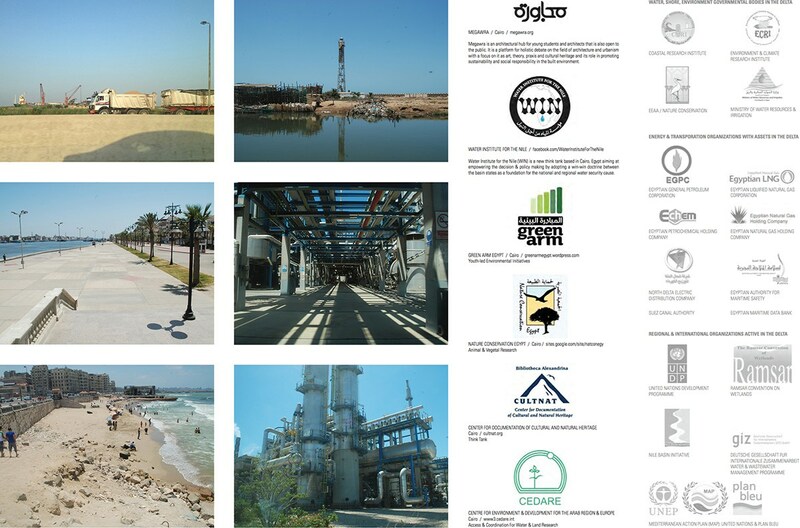 To investigate the professional and institutional context in charge of the construction, management, governance and use of engineered coastal works. 3. 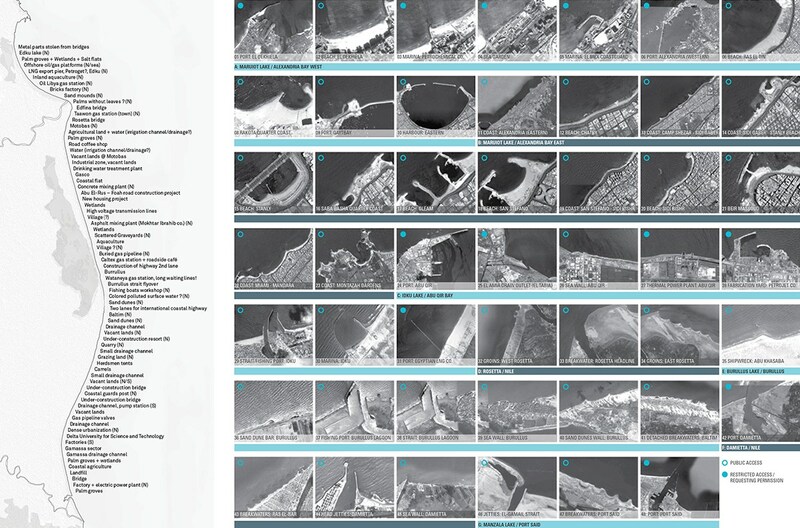 To explore the potentials of novel cartographic and diagrammatic representation practices to qualify the infrastructural landscapes of coastal protection as sites for critical spatial intervention.